Jon caught up with drummer Jeremiah Edmond of Manchester Orchestra prior to their sold out headline show at the Camden Barfly, London. Jeremiah spoke to Alter The Press about the bands new record 'Mean Everything To Nothing', their close friendship with Brand New, Kevin Devine and mewithoutYou, starting Favorite Gentlemen Records with fellow band member Andy Hull, playing bad Weezer covers and more. Alter The Press: You’re back in the UK before the anticipated release of your new record, ‘Mean Everything To Nothing’. What can you tell us about the new record? Jeremiah Edmond: It is our second full length and we are very excited about it. It’s the first record we feel like we are extremely proud of and are ready to present to the world, to take as far as we can. It’s the first record with this full line up and we're very excited it’s coming out. ATP: You’ve made music videos to each track of the album, what made you want to do this? JE: Actually it was our manager Brad who had the awesome idea. When we asked Clay Lipsky and Jason Bognacki, who together did the video of ‘I Can Barely Breathe’ from our last album, to do it, they said it was too big of a project for them to take on but, after they got the record, they really enjoyed it and decided they wanted to do it. Our management came up with the idea, but Jason and Clay came up with all the creative elements of it; we gave them full creative way to do whatever they want. It takes two weeks for them to make each video, they'd give us a close-to-finished version, make a couple of tweaks, then it’s ready to go. We have to give them most of the credit. ATP: The video for ‘I Got Friends’ has just been released online the other day, what made you choose this as your first single? JE: Honestly, it was a natural decision between everybody. When we started talking about what the first single would be, it was the first choice. The chorus just sticks with you and the song shows a definite step away from our last record; and we wanted the first single to show that. ATP: How would you compare ‘I’m Like A Virgin Losing A Child’ (debut album) to ‘Mean Everything To Nothing’. JE: ‘Mean Everything To Nothing’ is more of a cohesive album. 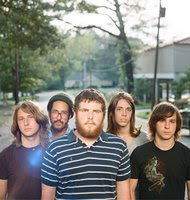 I feel like we are better musicians on it and Andy (Hull – lead vocals/guitarist of Manchester Orchestra) has defiantly grown as a songwriter on it. It’s more aggressive but still maintains the dynamics that we had on ‘I’m Like A Virgin…’ but the song dynamics are more extreme and jump from song to song. We tried not to use the same tricks on this record but be smarter with the dynamics and really let the songs let them flow, without being so drastic, like soft and loud, back and forth. ATP: What is your favorite track to play from the new record? JE: I think, right now, ‘Everything To Nothing’ is my favorite track to play. That song and ‘Pride’. ATP: You guys have a very close friendship with Kevin Devine, The Color Revolt, Brand New, mewithoutYou and Thrice, sort of a 'crew' so to speak. How did you find yourselves being close friends? JE: With Kevin, we did a tour with Brand New with Kevin and that’s how we met him. Brand New, Andy went out on a tour with The Color Revolt, who we were friends with, who had been on tour with Brand New already so he struck up a friendship with Jesse (Lacey – vocals/guitarist of Brand New) and the rest of the guys, that led to us touring with them and Kevin. I think Brand New gave our record to mewithoutYou, who asked us to tour with them. The Color Revolt though, was the first band to ever take us out on tour,and gave us a chance, so we have been friends with them for ages. It happened naturally by just being on the road all the time. ATP: If you could be booked on any tour, which would it be? JE: Probably those bands. Touring with your friends is the best way to do it. It makes being away from home a lot easier, getting to watch bands that inspire you every night. Playing with those guys is just amazing. ATP: The best example of how close you are, I think, was when you guys played Reading/Leeds Festival a few years back, you guys coming out on a small stage, playing covers of Weezer and Neutral Milk Hotel. JE: It was funny because we actually didn’t know how to play any of those songs! It’s great to make sound to something that honestly was the worst sounding thing ever but it was a lot of fun. That’s the great thing about being on tour with friends, that we can just go on stage and have fun. ATP: What made you want to start Favorite Gentlemen Records with Andy? JE: It started with a name we just needed to put on an EP we were putting out and make it look more professional; that’s where the name ‘Favorite Gentlemen’ came from. As we were releasing our EP, we realized we were coming up the same time as these other bands from Atlanta (home town) and other bands around the country that were really great. We figured, if we stuck together and used the same name ‘Favorite Gentlemen,’ we’d all help each other out and draw attention to each other. If one band gets some attention, it has a ripple effect and affects all of the other bands in a positive way. It started as a loose community of artists associating themselves together and supporting each other. Once we got our record deal, we were able to secure funding and distribution for the label, so now we are taking a step further, by signing artists and officially releasing their records. We met Kevin Devine when he didn’t have a label, when going to make his new record, so we set up a deal and ended up signing him; which is our first full on national release. At the moment we are talking to labels to see whom we can get to release his record in the UK, and the same with Right Away Great Captain (Andy’s solo acoustic project). It’s really grown and we have 14 artists, 5 actual signed roster artists and a bunch of community artists. We’ve just expanded to include producers, designers, and photographers; people like that who work with bands. JE: Hopefully during the summer; we haven’t secured any dates yet but we are hoping maybe July. 'Mean Everything To Nothing’ is out April 22nd on Favorite Gentlemen Records.